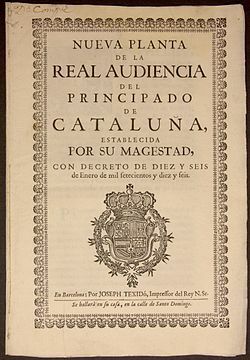 The Nueva Planta decrees (Spanish: Decretos de Nueva Planta, Catalan: Decrets de Nova Planta) were a number of decrees signed between 1707 and 1716 by Philip V—the first Bourbon King of Spain—during and shortly after the end of the War of the Spanish Succession by the Treaty of Utrecht. Angered by what he saw as sedition by the Aragonese and taking his native France as a model of a centralised state, King Philip V suppressed the institutions, privileges, and the ancient charters (Spanish: fueros, Catalan: furs) of almost all the areas that were formerly part of the Crown of Aragon (Aragon, Catalonia, Valencia, and the Balearic Islands). The decrees ruled that all the territories in the Crown of Aragon except the Aran Valley were to be ruled by the laws of Castile ("the most praiseworthy in all the Universe" according to the 1707 decree), embedding these regions in a new, and nearly uniformly administered, centralised Spain. The other historic territories—Navarre and the other Basque territories—supported Philip V initially, whom they saw as belonging to the lineage of Henry III of Navarre, but after Philip V's military campaign to crush the Basque uprising, he backed down on his intent to suppress home rule. The acts abolishing the charters were promulgated in 1707 in Valencia and Aragon, in 1715 in Majorca and the other Balearic Islands (with the exception of Menorca, a possession of the Kingdom of Great Britain at the time), and finally in Catalonia on 16 January 1716. The decrees effectively created a Spanish citizenship or nationality, that judicially did not distinguish between Castilian and Aragonese anymore, both with respect to rights and law. They abolished internal borders and customs except for the Basque territory, giving grant to all Spaniards to trade with American colonies (not only Castilians, as before). Philip of Anjou won the War of the Spanish Succession and imposed unification policies over the Crown of Aragon, which had supported the claim of Karl of Austria. These acts constituted the first successful realisation of Spain as a centralised state and were meant both as a modernising element, in line with other European countries where their monarchs were increasing their powers, and also as a punishment on these territories which had fought against Philip V in the War of Succession. Henceforth, top civil servants were appointed directly from Madrid, the King's court city, and most institutions in these territories were abolished. Court cases could only be presented and argued in Castilian, which became the sole language of government, displacing Latin, Catalan and other Spanish languages. This article draws on material from the corresponding article in the Spanish Wikipedia, accessed January 2006. ^ a b Stanley G. Payne. "Chapter 16, The Eighteenth-Century Bourbon Regime in Spain". A History of Spain and Portugal - Vol. 2. Retrieved 17 April 2008.